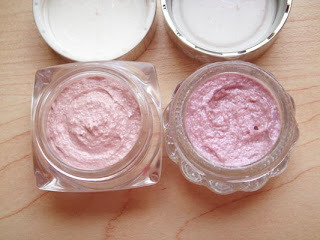 Since my previous post about Coffret D’or Fluffy Shine Eyes, some blogger friends were interested in how it compared to the Jill Stuart Jelly Eye Color N. So today I’ll be doing a comparison review on the two products. I picked 02 Ruby Pink from the Fluffy Shine Eyes and 103 Snow Parfait from the 2009 Christmas set since they are similar in color. 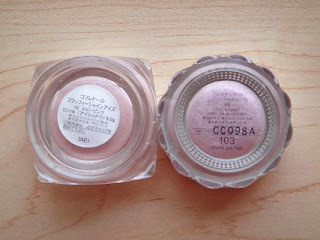 Fluffy Shine Eyes was released on July 16, 2008 as the 2nd part of Coffret D’or fall collection. Almost a year later Jelly Eye Color N was released on June 5, 2009 which replaced the original Jelly Eye Color. Both are permanent items so they should be easy to locate. I like the packaging design for most Coffret D’or items. It’s normal for a Japanese cosmetics brand. But I’m not particularly fond of the shape and plastic material of the jar on the Fluffy Shine Eyes. It’s somewhat cheap to my liking. However Jill Stuart is one step above. 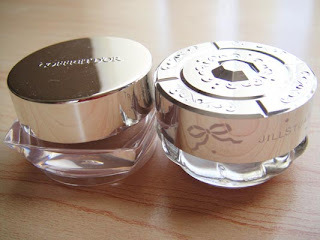 Its glass container with arabesque patterned cap design is cute and princess-y. No other brand can compare to Jill Stuart. If you calculate price per gram, Fluffy Shine Eyes (400) is even more expensive than the Jelly Eye Color (367). But it really depends on how you look at it. I don’t think I can even finish either of them so the cheaper the better. Apparently Jelly Eye Color has more selection than the Fluffy Shine, but for me it’s not a big deal since I got most colors I need from its 5 shades. It’d be nice to have more colors. Jelly Eye Color really wins on this. It’s got a pleasant floral scent which is not too strong either. On the other hand Fluffy Shine Eyes has a stronger alcoholic smell, luckily it disappears quickly. The texture of both are pretty much similar. They are spongy jelly like and fun to the touch. The Fluffy Shine Eyes seems thinner and smoother though due to its smaller particles. For the cream shadows you really need to dip your finger inside and get stained. It’s just the way it is. I wish there’s a more hygienic way of doing it. Both have that sparkly finish. The only slight difference is that Fluffy Shine Eyes are more on the shiny side. It contains more silver shimmer. 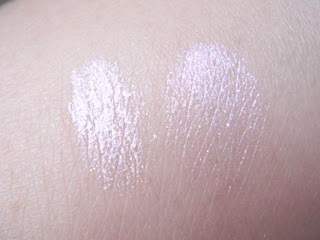 While Jelly Eye Color has bigger pink sparkles. They’re both really pretty and I like them both. 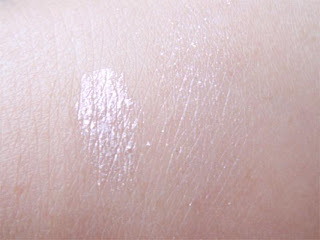 In order to test the lasting power, I swatched them on the back of my hand without primer. I waited for a minute or two until I rub around. Fluffy Shine truly stays there without budging a bit. Sadly Jelly Eye Color got all smudged up. However if you use it as an eyeshadow base or with good priming, it won’t be a problem then. I really can’t tell you which one is better. It only depends on personal preferences. I’m only doing a review by showing the facts of both products. Both have cons and pros. It depends on what you’re looking for, for example color selection and how you stand the smell, staying power, etc. On a side note, according to product website Fluffy Shine Eyes contains natural collagen (moisturizer) and pure shine pearl while Jelly Eye Color contains pure crystal powder. Thanks for comparing them! I never knew that JS is cheaper! !